Now available, from Amazon, Barnes & Noble, or an independent bookstore near you. Or order a signed copy from my friends at G. WIllikers! Educators! Download a free teachers' guide, courtesy of Candlewick Press. Behold the story of Sophie Blanchard, an extraordinary woman who is largely forgotten despite her claim to being the very first female pilot in history. In eighteenth-century France, "balloonomania" has fiercely gripped the nation . . . but all of the pioneering aeronauts are men. The job of shattering that myth falls to a most unlikely figure: a shy girl from a seaside village, entirely devoted to her dream of flight. Sophie is not the first woman to ascend in a balloon, nor the first woman to accompany an aeronaut on a trip, but she will become the first woman to climb to the clouds and steer her own course. 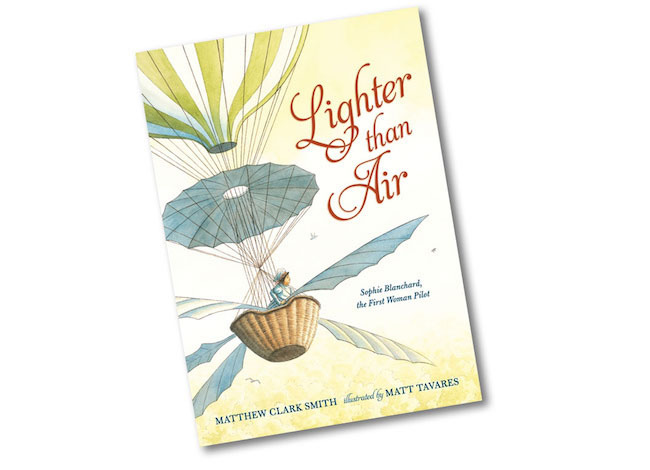 The words of Matthew Clark Smith bring Sophie's story to light after so many years, while Matt Tavares's atmospheric art and unique perspectives take her to new heights. 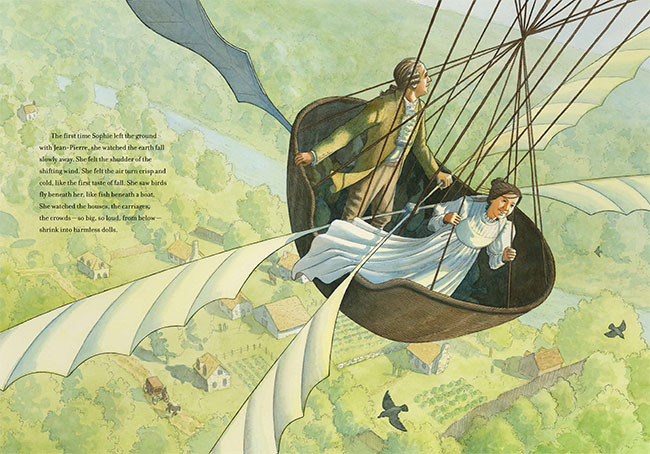 Take to the skies with the beautifully told tale of Sophie Blanchard, a woman meant for the air, as she discovers the incomparable sensation of flight. "Smith tells Sophie's inspiring story with a buoyant sense of wonder, fitting for a woman who was happiest in the air. Her accomplishments and passion for flight are brought beautifully to life by Tavares' soft watercolor, gouache, and pencil illustrations, which make expressive use of shadow and light, casting brooding clouds over solemn scenes or amplifying joyful moments with blue or golden skies. "Smith's prose- rich, poetic, and strong on active verbs- is a fine match for Tavares' gorgeous ink-and-watercolor illustrations, which focus on Sophie and the skies, his palette pairing Sophie's moods with the colors of the skies. The other stars- the balloons themselves- are dazzling, with intricate lines, rich colors, and swelling bags ready to go aloft. 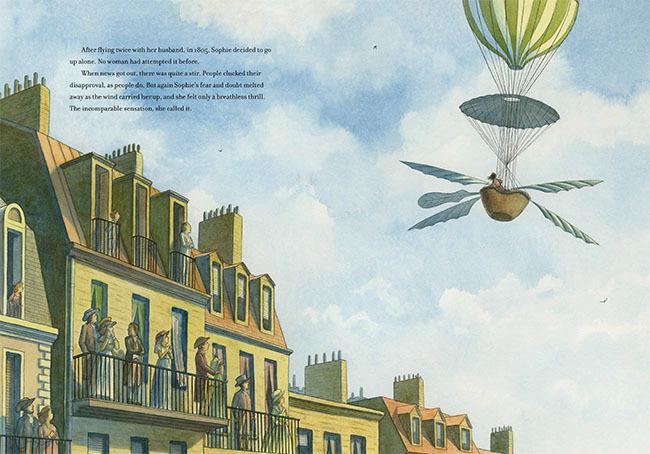 His strong, monumental style and steady lines give even the most perilous-looking of Sophie's aerial perches comforting stability...."
"This amazing tale of the first female pilot is illustrated in ink and watercolor, with the changing sky becoming a character itself. A story that needs to be shared." "The words are poetic and descriptive. The illustrations are airy and free, and one feels the sensation of flight throughout the text and illustrations. Since libraries and classrooms are anxious to purchase books referencing STEM activities, this book will surely be a hit. The book is historical as well as entertaining and full of information... This title is a must for all school libraries." LIGHTER THAN AIR. Illustrations copyright 2017 Matt Tavares. Reproduced by permission of the publisher, Candlewick Press, Inc., Somerville, MA.